There are a lot of reasons that music lovers get into turntables, vinyl, and the wonderful world of buying and collecting records. But no matter what your motivations for getting into vinyl, you're going to need a basic stereo setup. In the space below, we're going to outline some essential considerations and options for anyone looking to buy their first turntable and speaker set. It's a vast subject matter with endless debates and finer details, and our intent here is to simply cover the basics for anyone that's new to the game. For the benefit of anyone who doesn't want to wade through the murky waters of vintage vs. new, passive vs. active, and other prickly topics, here are two excellent entry-level packages from the good people at The Turntable Lab in New York. Both offer a good starting point for any listener. If you feel like finding a more custom solution to your particular vinyl ambitions, keep reading below for some key considerations and guidelines for choosing the components that are right for you. Once you've chosen a system that suits your needs, head on over to Reverb LP for all your record buying needs. To start, here are some basic components that you'll find in every stereo setup. These terms will crop up again and again as you start to piece together your system. Turntable—A turntable is the unit that actually plays the record and creates the signal that is then transmitted to the rest of the stereo. Turntables operate with either a belt- or direct-drive, though most higher-quality systems use a direct-drive mechanism. Cartridge—The cartridge is a device that contains the needle, also called the stylus, which is the only part of the phonograph to touch the vinyl. 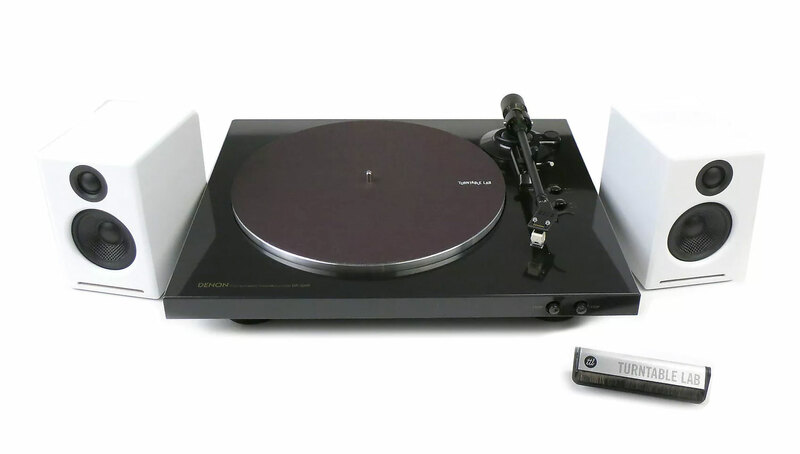 Most beginner turntables will include a cartridge, but some used listings may not. Preamp—In the context of a stereo system, a preamp is a device that goes between the turntable and the amplifier to get the signal coming out of the turntable to the right level. Many modern setups require a standalone preamp, which are usually labeled as "phono preamps" (more on that below). Amplifier—An amplifier is a device that provides the power needed to move the speakers and create sound. Amplifiers can be found as standalone devices or can be built into other components of the system. Speakers—The speakers are the final step in the signal chain. Speakers come in two main varieties: passive and powered. Powered speakers (also called "active speakers") contain an amplifier internally and do not require an external amplifier. Conversely, passive speakers will require some sort of amplifier to operate. Most vintage speakers are passive. Stereo Receiver—A stereo receiver is a combination device that combines an amplifier and a preamp, often along with things like a radio or equalizer. With vintage setups, the stereo receiver is often the centerpiece of the entire system, taking the audio signal from the turntable and providing the power needed to operate the speakers. Now that we have the terminology laid out, let's explore four different routes you can take to start off on your record playing journey. The simplest and often cheapest route to a complete, functional record player is via a standalone, integrated stereo. These basic systems combine a turntable, speakers and all the inner workings to offer an extremely intuitive, single box solution. While cheap and convenient, integrated units like this are typically made with lower-end parts that frankly sound worse than most other options. In some cases, they may even damage your records. If you can only afford something like this, there is no shame in using an integrated system as a first step. Longer-term though, you'll want to upgrade to one of the setups described below. These days, a popular option for building a stereo system revolves around combining virtually any turntable with a pair of powered speakers. As shown in the diagram above, going for this route will require a preamp designed to take the signal from the turntable and convert it to a proper level to interface with any set of speakers. This is often called an phono preamp or sometimes an RIAA preamp in reference to an age-old signal standard set by the RIAA. Keep in mind that some modern turntables will include a preamp internally, so some do not require this additional component. When buying a turntable, the first thing to consider is whether you want to buy new or vintage. Vintage or used turntables can be a great value (especially if you're able to get a relative to dig one out of the basement) but can also be a bit unpredictable in terms of maintenance and exact specs. Important Note: Some modern turntables output at a level that can be connected directly to your speakers without a phono preamp. Often these turntable models will say that they have a built-in preamp. For those interested in an older-school and potentially cheaper system, there's no lack of viable vintage and used stereo equipment to consider. Most vintage stereo setups revolve around a stereo receiver that combines a preamp and amplifier into one box to allow you to connect your turntable on one end and your speakers on the other. Simply run the RCA cable out of the back of the turntable and into the receiver, then use speaker cable to connect the receiver to your speaker pair. Say you start with a great old pair of passive speakers you find at a thrift store or in an uncle's attic. With the right stereo receiver you'll be able to run those with pretty much any turntable, vintage or modern. Now, it should be noted that not every stereo receiver is primed to work with every set of speakers, especially very small or very large models. You should find a pair of speakers that are large enough to handle the full bass-to-treble range, but without being so big that the stereo can't adequately drive them. For a more in-depth explanation of speaker impedance, you can check out this great resource from Lifewire. If you think that a vintage stereo receiver and speaker set is right for you, take a look at the pages and pages used HiFi gear on Reverb as a first step. Keep in mind also that you can always mix and match old and new components. A set of vintage speakers, for example, can run just fine with a modern amplifier like this entry-level option. Say you already have a home stereo system or Bluetooth speaker that provides ample volume and sound quality for your tastes. Connecting any sort of turntable to these sorts of speakers is actually relatively straightforward. 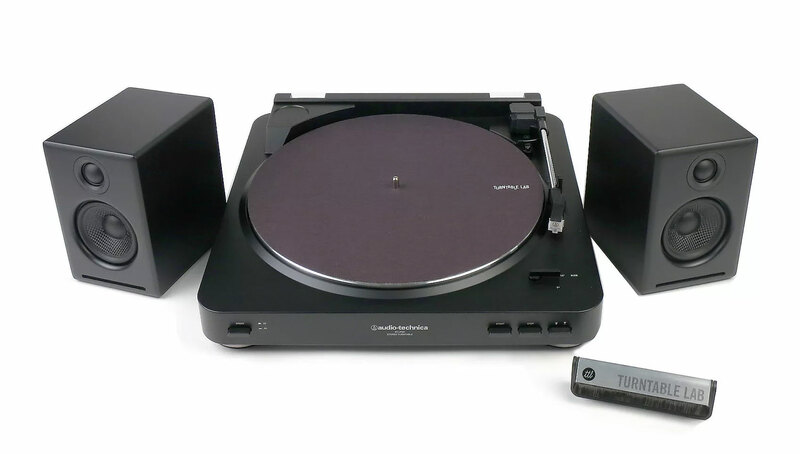 Much like the systems outlined up top, it will require either an external phono preamp or a turntable that has a built-in preamp as part of its design. In either case, you should be able use either an RCA or 1/8th-inch stereo output from the preamp and connect to the AUX input on your speaker or stereo.